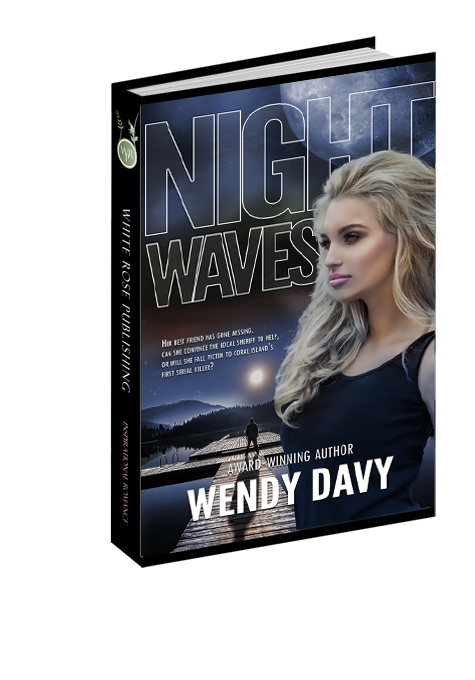 Newspaper reporter, Cali Stevens, boldly walks into Sheriff Nick Justice’s office with one goal in mind: To find her best friend who disappeared while vacationing. When the no-nonsense sheriff refuses to give her details of the investigation, Cali takes matters into her own hands and starts her own investigation. She never intends to fall for the sheriff…or into the clutches of Coral Isle’s first serial kidnapper. Coral Isle’s recent abductions give Nick Justice enough to worry about without adding any complications into the mix, and his attraction to Cali Stevens is definitely a complication. When Nick encourages Cali to leave the island, she refuses. Now he must manage to find the missing women while keeping Cali and the rest of the women on Coral Isle safe. He ground his teeth and sighed as his irritation grew. “It’s getting late. I’ll walk you back to your room.” He turned on his heel and picked up the water bottles, napkin and the sandwich wrapper, dumping them into the poolside trash can before facing her again. Cali looked away, took in a deep breath and walked past him out of the pool gate. He let her lead the way back to her rented room. Stopping in front of the door, she wrapped her arms around herself and studied her toes. A brief flash of pain crossed her eyes before they became guarded.